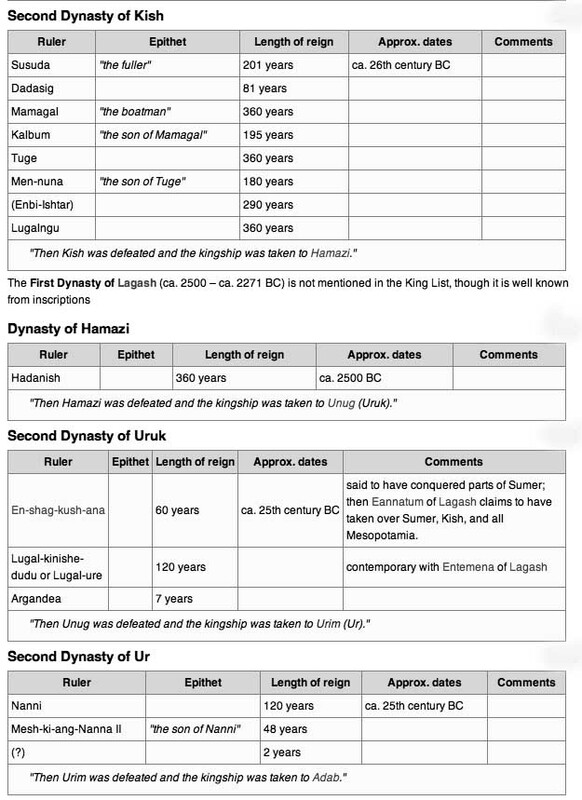 The list blends prehistorical, presumably mythical predynastic rulers with implausibly lengthy reigns with later, more plausibly historical dynasties. 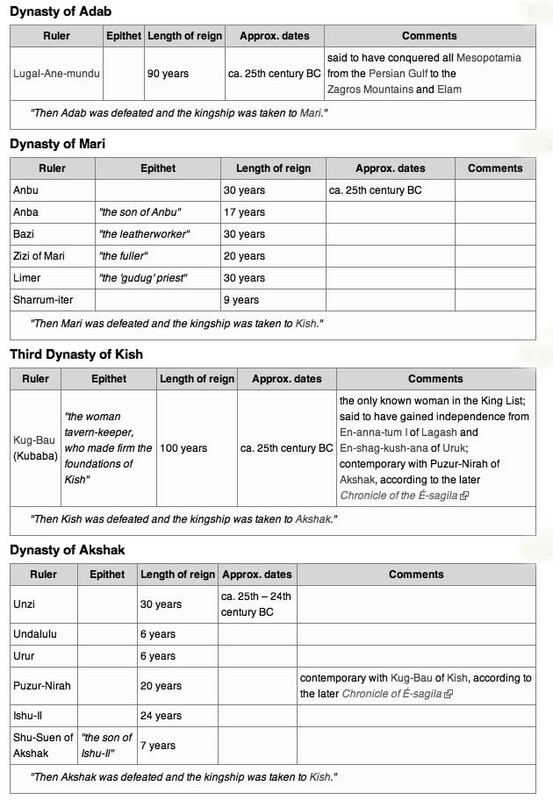 Although the primal kings are historically unattested, this does not preclude their possible correspondence with historical rulers who were later mythicized. Some Assyriologists view the predynastic kings as a later fictional addition. 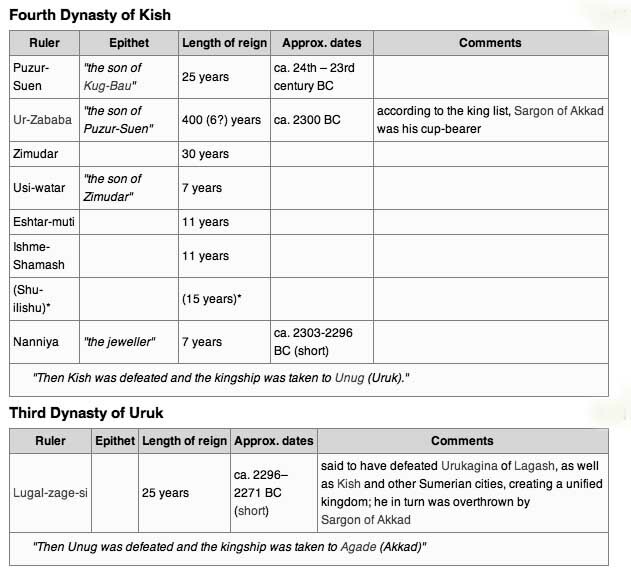 Only one ruler listed is known to be female: Kug-Bau "the (female) tavern-keeper", who alone accounts for the Third Dynasty of Kish. 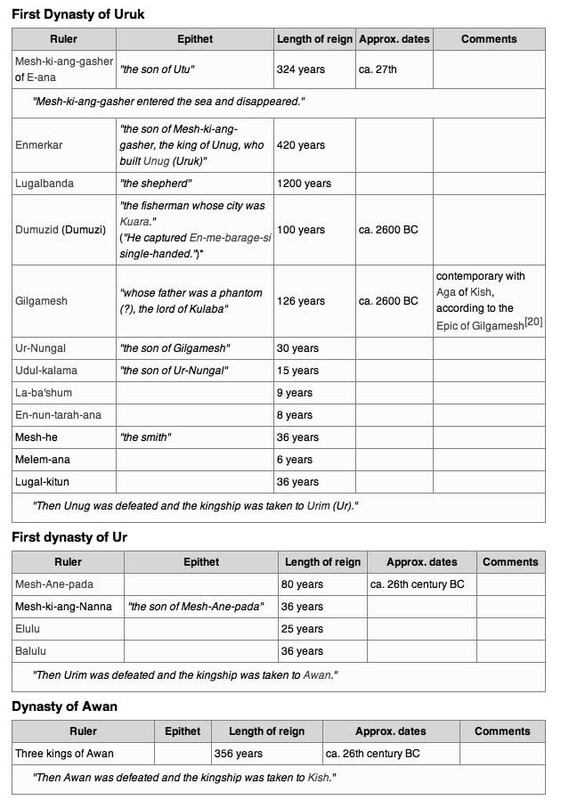 The earliest listed ruler whose historicity has been archaeologically verified is En-me-barage-si of Kish, ca. 2600 BC. Reference to this individual in the Epic of Gilgamesh has led to speculation that Gilgamesh himself may be historical. 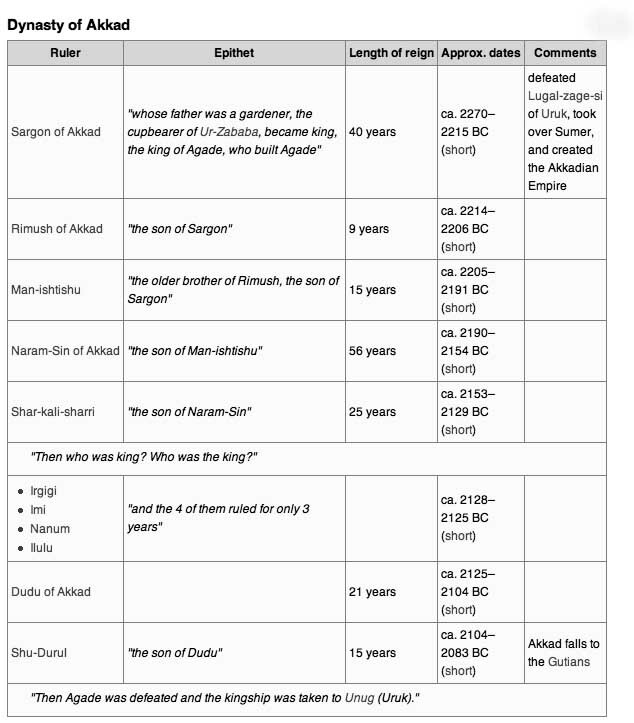 Three dynasties are notably excluded from the list: the Larsa dynasty, which vied for power with the (included) Isin dynasty during the Isin-Larsa period; and the two dynasties of Lagash, which respectively preceded and ensued the Akkadian Empire, when Lagash exercised considerable influence in the region. Lagash in particular is known directly from archaeological artifacts dating from ca. 2500 BC. 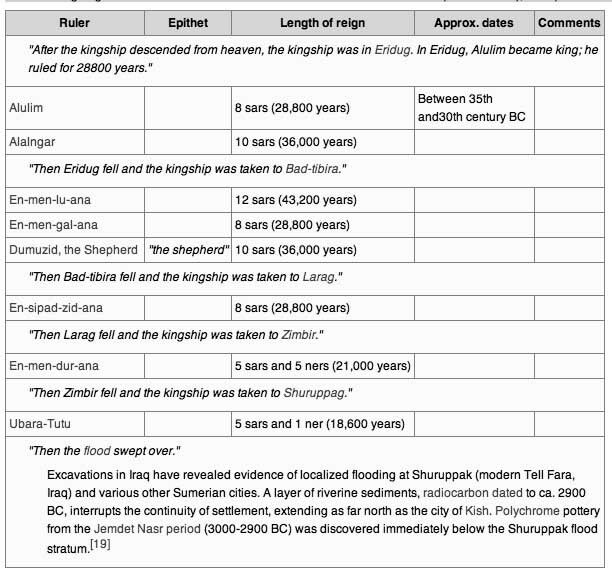 The list is important to the chronology of the 3rd millennium BC. 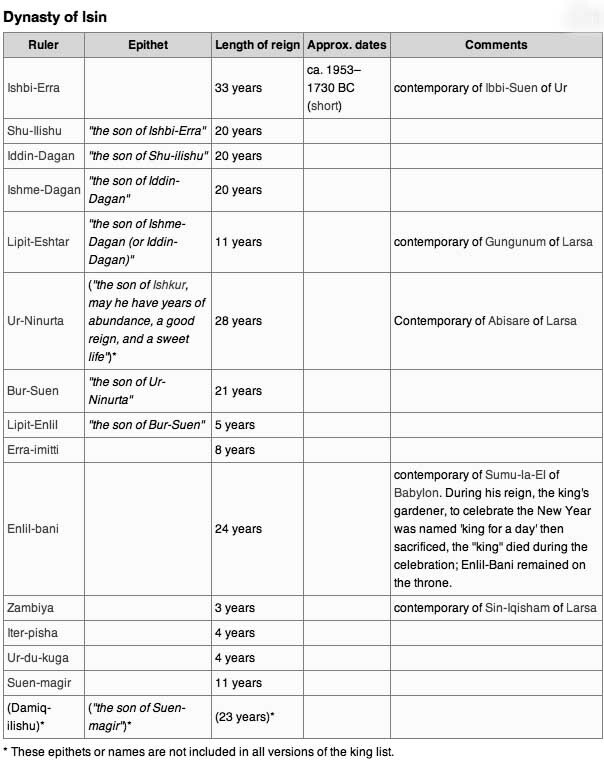 However, the fact that many of the dynasties listed reigned simultaneously from varying localities makes it difficult to reproduce a strict linear chronology. The first two sources (WB) are a part of the "Weld-Blundell collection", donated by Herbert Weld Blundell to the Ashmolean Museum. WB 62 is a small clay tablet, inscribed only on the obverse, unearthed from Larsa. It is the oldest dated source (c. 2000 BC) containing the list. WB 444 in contrast is a unique inscribed vertical prism, dated c. 1817 BC, although some scholars prefer c. 1827 BC. 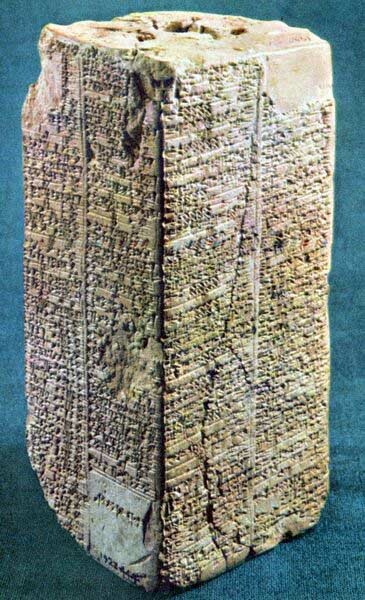 The Kish Tablet or Scheil dynastic tablet is an early 2nd millennium BC tablet which came into possession of Jean-Vincent Scheil; it only contains king list entries for four Sumerian cities. UCBC 9-1819 is a clay tablet housed in the collection of the Museum of Anthropology at the University of California. The tablet was inscribed during the reign of the Babylonian King Samsu-iluna, or slightly earlier, with a minimum date of 1712 BC. The Dynastic Chronicle (ABC 18) is a Babylonian king list written on six columns, beginning with entries for the antideluvian Sumerian rulers. K 11261+ is one of the copies of this chronicle, consisting of three joined Neo-Assyrian fragments discovered at Library of Ashurbanipal. K 12054 is another of the Neo-Assyrian fragments from Uruk (c. 640 BC) but contains a variant form of the antediluvians on the list. The later Babylonian and Assyrian king lists, preserved the earliest portions of the list well into the 3rd century BC, when Berossus' Babyloniaca popularized fragments of the list in the Hellenic world. In 1960, the Apkullu-list (Tablet No. 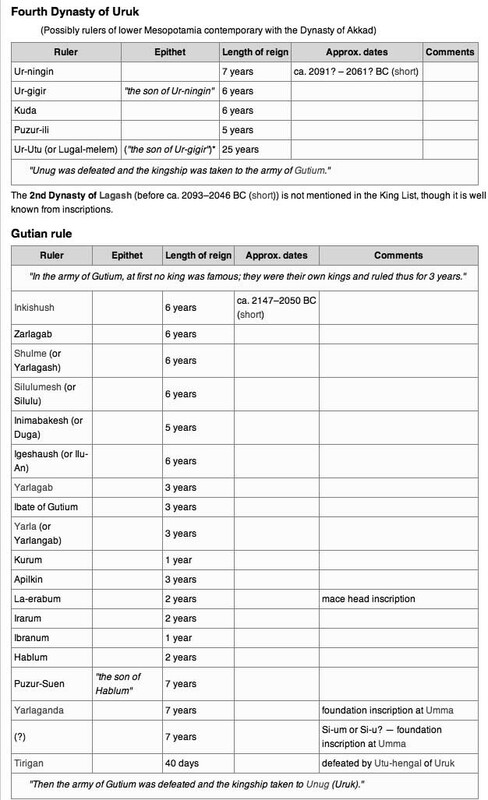 W.20030, 7) or ÒUruk List of Kings and SagesÓ (ULKS) was discovered by German archaeologists at an ancient temple at Uruk. 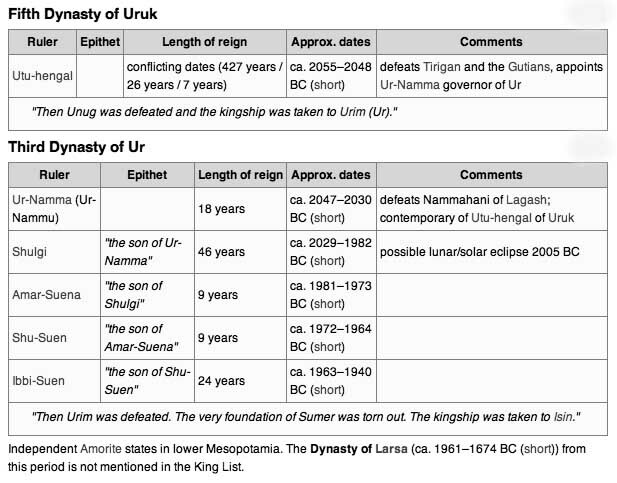 The list, dating to c. 165 BC, contains a series of kings, equivalent to the Sumerian antediluvians called "Apkullu". 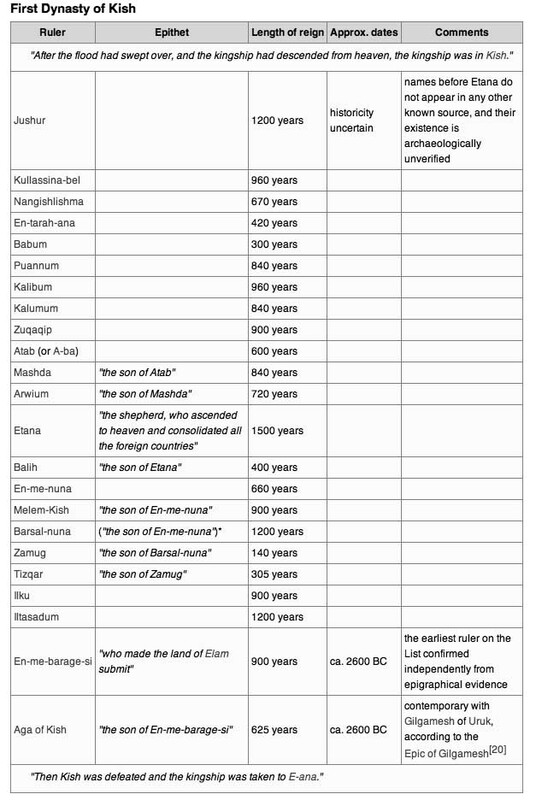 None of the following predynastic "antediluvian" rulers have been verified via archaeological excavations, epigraphical inscriptions, or otherwise. It is possible that they correspond to the Early Bronze Age Jemdet Nasr period culture which ended approximately 2900 BC, immediately preceding the dynasts. It is also possible that they were fictional creations to make the kingdom seem more legitimate and ancient to its subjects which would explain the exaggerated lifespans and recurring and composite characters that have overwhelming similarities with their predecessors. The following reigns were measured in Sumerian numerical units known as sars (units of 3600), ners (units of 600), and sosses (units of 60).